Laser welding has become an accepted technique for joining materials ranging from delicate plastics to dense metals. Applications include medical, aerospace, military, alternative energy and many other high profile industry sectors. Tremendously versatile, laser welding is used for sealing micro-electronic devices implanted into a human body to joining sections of fuel tanks in a rocket. Many factors affect which laser is best suited for a particular project. This article is the first in a series examining the decision-making criteria of the engineering staff at EB Industries as we develop laser welds for customers’ needs. One of the core decisions to be made is whether the weld process will use a continuous wave laser or a pulsed laser. Continuous wave (CW) lasers are lasers that emit a constant, uninterrupted beam. They are usually Fiber style lasers that use diodes switched on to excite a gain medium, thus outputting laser light. CW lasers are especially suitable for deep penetration welds (over .060” deep), and welding crack sensitive materials like high carbon stainless steels. CW lasers can be run at power levels as low as 200 Watts to as high as 100,000+ Watts. CW laser welding requires 200 watts or higher to successfully couple most metals. This wide power range, mixed with high energy densities, aids in fusing metals with different thermal and reflectivity characteristics. For example, ferrous metals, such as stainless steel, couple at lower power (roughly 200w), while materials like aluminum and copper couple at significantly higher power (600-800w). CW lasers usually run at high feed rates to prevent overheating the part. Typical CW feed rates are around 100 inches per minute. Power and feed speed must be precisely balanced to obtain a weld with the specified penetration. The slower the feed rate, the deeper the penetration and the more heat applied to the part. Pulsed lasers produce a series of short pulses at a certain width and frequency. A pulsed laser can produce a peak power that is greater than its average power because energy is stored up in capacitors before it is released. Pulsed lasers are capable of very high peak powers: a 25 W pulsed Nd:YAG laser can produce peak powers up to 5 kW for a few milliseconds. This means it can produce a spot weld that would require a CW laser sized at 5 kW! 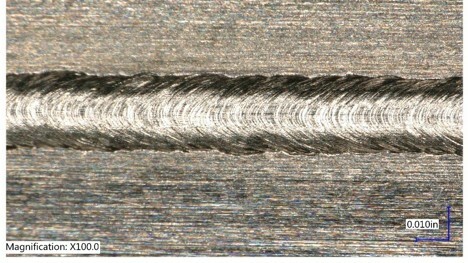 With pulsed lasers, a seam weld is created by a series of overlapping spot welds. For hermetic sealing applications, these spot welds are overlapped between 80-90%. For simple structural welds that do not need to be sealed, the overlap can be relaxed to around 70%. 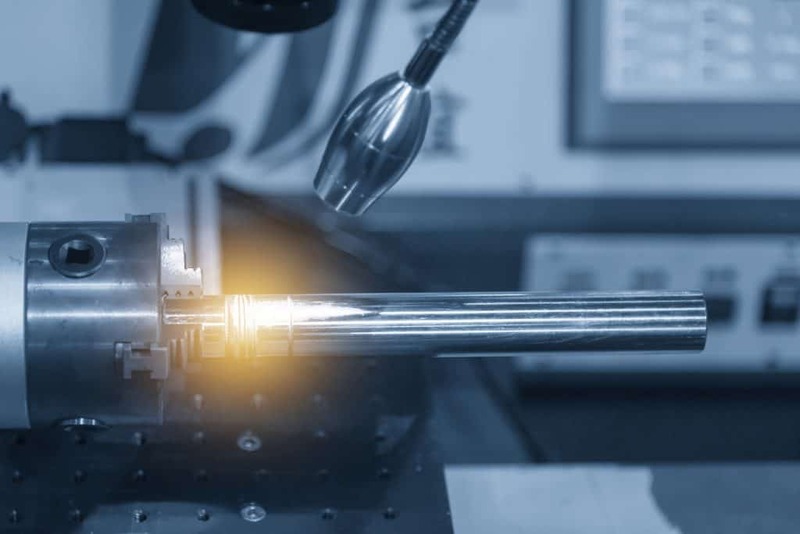 Due to the short duration of the pulse (typically a few milliseconds long), heat entering the part is minimized, making pulsed laser welding recommended for use around heat sensitive components and very thin-walled materials. Pulsed laser welding tends to work well with reflective metals due to the high amounts of energy delivered at the onset of the pulse. Often referred to as an “Enhanced Pulse,” this spike of power at the beginning of the pulse cycle only lasts a fraction of the total pulse duration. However, it is powerful enough to break past the reflectivity of the material, while keeping the average power low, which reduces heat. A CW laser would have to deliver a lot of energy to couple a very reflective metal, and the resultant heat could easily damage the part or components inside of it. Welds involving crack sensitive materials, such as 430, 316 and 303 stainless steel. High volume production jobs that can take advantage of the higher feed rates associated with CW laser welding. Non heat sensitive weld joints. Welds on highly reflective metals like aluminum and copper. Welds near heat sensitive components or thin-walled, heat sensitive weld joints. Obviously, there are criteria beyond continuous wave or pulsed that must be considered when engineering the welds for applications. We will be covering more about laser welding in future articles. Please contact the engineering staff at EB Industries if you have any questions or requirements – we’re here to help.